John Golden, assistant professor of business and director of the Sustainable Enterprise Accelerator at Slippery Rock University, joins Joseph Ssekandi, professor of environmental and climate change adaptation at Uganda Martyrs University in adjusting a water discharge tube at SRU’s aquaponics prototype. Students from SRU and UMU will collaborate next year on an aquaponics project for the soilless growing of plants. SLIPPERY ROCK, Pa. - Ugandan professor Joseph Ssekandi traveled to America for the first time the week of June 5 to see what appears, on the surface at least, to be little more than a couple of shallow swimming pools at Slippery Rock University. However, it's what will eventually grow in those pools will benefit students, farmers, the Ugandan economy and a budding partnership between SRU and Uganda Martyrs University. Ssekandi's visit is yet another step in a burgeoning aquaponics project at SRU that has been years in the making. Aquaponics is an integrated system that combines raising fish, or aquaculture, and the soilless growing of plants, or hydroponics. Through SRU's Sustainable Enterprise Accelerator, a University-owned, student-run business consultation firm, a team comprised of SRU students, faculty and members of the local community started building an aquaponics prototype last summer that will help others adopt the sustainable plant-growing system, beginning with the Ugandan group. "There's a lot of things that we can learn together," said Ssekandi, professor of environmental and climate change adaptation at UMU. "I'm really open-minded in terms of research and collaboration." Ssekandi spent his time in Slippery Rock learning how SRU built its aquaponics prototype, which is housed at the Macoskey Center for Sustainable Systems Education and Research. He also met with SRU faculty, students and administrators, including John Golden, assistant professor of business and director of the SEA. Together they are planning ways to not only build an aquaponics system that Ssekandi's students can learn from, but also develop ways that SRU students can collaborate, share best practices, simplify the technology and ultimately deliver methods so that Ugandans can have produce available to eat and sell during long droughts. "If we're able to demonstrate that this works, we'll be able to transfer this technology to other parts of the world, not just Africa," Golden said. "We're hoping this is the initial prototype for a long relationship for the universities to explore other types of cultural, scientific and environmental exchanges." 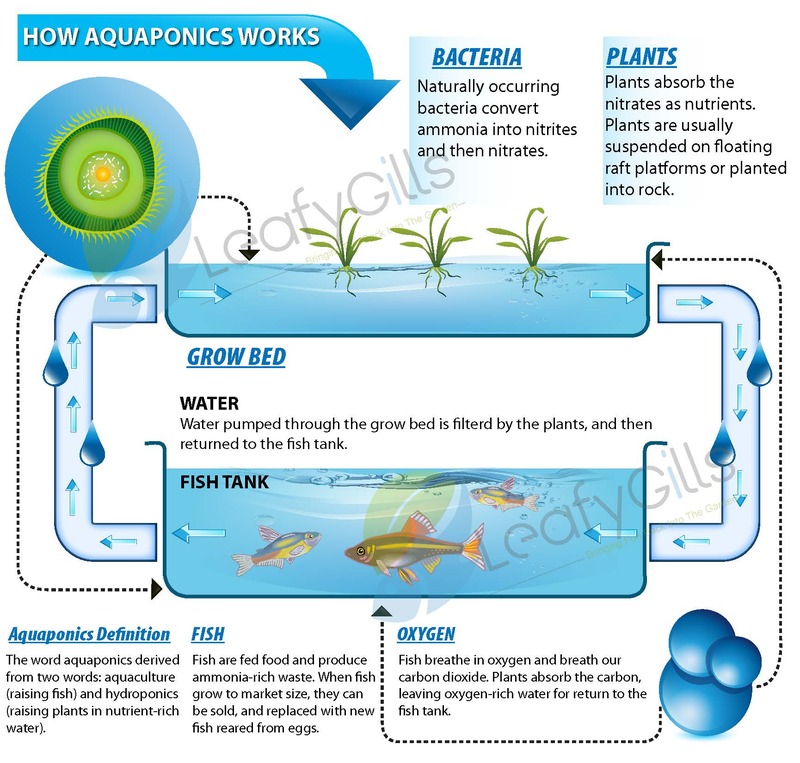 The aquaponics process is achieved through a symbiotic relationship between fish and plants in separate, adjacent tanks. Fish waste is pumped from one tank to provide an organic food source for plants that sit on containment trays above a second tank. The plants naturally filter the water back to the fish tank for the fish to prosper. Aquaponics can increase the yield of vegetation up to seven times normal soil production because it does not follow the normal growing season and requires 90-93 percent less water for growth. Sizes of the tanks can vary by need, but the prototype at SRU is 16 feet by 4 feet and 3 feet deep for the plant tank and 8 feet by 5 feet and 2 feet deep for the fish tank. Water is pumped through an air lift system using a 200-watt solar panel at three amps per hour. "It's a living laboratory for every discipline," said aquaponics project director Daniel Burtner, a senior double major in marketing and sustainable management from Butler. "Students learn marketing, science, business management, teaching and they'll being able to see the fruits of their labor. It's not just what they get out of a textbook." "If any SRU students want to get involved in a project that can actually make a difference in the world, they can do it here," said Golden, who added that the project is open to all SRU students and community volunteers, not just the 17 interns at the SEA. "It's an amazing thing to see the students involved in the cultural exchange, to understand how other cultures think. It's been a learning experience in a lot of different areas. The aquaponics is just sort of a vehicle." Because of the sub-70-degree temperatures during Ssekandi's visit, the tanks did not have fish. Tilapia, a fish that reproduces quickly, will soon be added to the fish tanks and vegetables such as tomatoes, basil and lettuce will grow on the second tank. Golden anticipates the system to be fully functional by the start of the fall 2017 semester. A greenhouse will be built to protect the tanks and extend the growing season. Nearly $15,000 has already been raised for the project through private donations, which include faith-based organizations and individuals like Slippery Rock resident Ken Bennett, who provided the seed money and founded the project as a SEA client. Bennett is active in the Rotary Club, which funded a project in Lukaya, Uganda, to support the Mustard Seed Academy, a school for orphaned and abandoned children. After making a visit to see the facilities in Uganda, he was eager to do more. Bennett wanted to create an enterprise that could be sustained by the Ugandan people, not American missionaries. "We knew so many well-intentioned Westerners who would go over for a week, build something and then walk away and say, 'Here you go; we built you something,' without buy in or local management," Golden said. Bennett eventually discovered aquaponics, a technique that is not new but difficult to implement in Uganda because the conventional farmers don't have the funding for start-up costs or the scientific knowledge to maintain it, such as balancing the right PH levels in the water or bacteria levels to change the ammonia into nitrates. "The road block that developed was that even though we know aquaponics and can build a system in Uganda, we can't stay there and teach," Bennett said. During a return trip to Uganda three years ago, Bennett showed up late one afternoon at UMU and was introduced to Ssekandi. In turn, Bennett introduced Ssekandi to the possibilities of implementing aquaponics in Uganda through a partnership with SRU. "Now we have a teacher," Bennett said. "He's very learned and interested in helping his country and expanding this idea." Under Ssekandi's direction, students at UMU will build their own aquaponics system this fall and interact with SRU students to determine best practices. Additionally, Golden plans to take credit hours out of his economics of sustainable development class in the spring 2018 semester for projects with Ssekandi's classes under a curriculum program called COIL which stands for Collaborative Online International Learning. "It's a been a lot of work," said Ssekandi, cracking a smile. "Of course, I came to work; I didn't come for holiday." However, should the partnership between the two institutions result in providing a new and sustainable food source for parts of the African nation, Ssekandi's trip abroad may earn him a holiday after all.